This is a simplified diagram of the skin and hair. As it illustrates, there are two main sections of the hair itself, the shaft and the follicle, as well as an attached sebaceous gland. Though the hair on your head and body may look like a simple, colored strand of keratin, there is much more to it that goes on below the skin. Understanding the anatomy of the hair, from the visible shaft to the lower follicle, is important as it helps us understand what causes hair loss and how best to prevent and treat it. 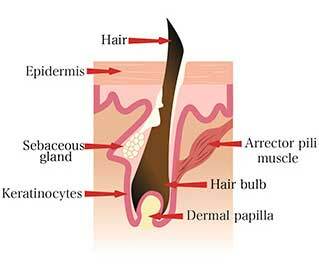 The follicle is composed of several layers that perform various functions. As can be seen in diagram B, the dermal papilla is the base of the hair follicle, containing capillaries that feed the hair cells with nutrients passed through the hair bulb. The hair bulb is the living part of the hair, fed by the papilla, and these living cells grow and multiply at a very quick rate. These cells divide every 23 to 72 hours, which makes them the fastest multiplying cells in the body, and their multiplication spurs the actual growth and of hair. The remainder of the hair follicle is composed of an inner and outer sheath, both of which serve to form and shield the growing hair shaft. The inner shaft ends at the sebaceous gland, while the outer sheath continues up the shaft and attaches to the arrector pili muscle. The contractions of this muscle are what causes the hair to stand up on end when the body is cold, nervous, or excited. The sebaceous gland is an exocrine gland connected to the hair follicle that secretes sebum. Sebum, an oily or waxy substance, is important to the skin because it naturally lubricates and waterproofs the skin. 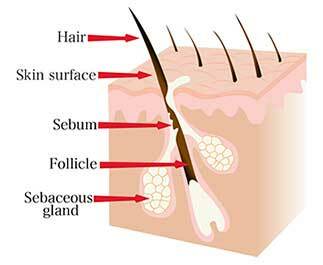 More than one sebaceous gland may be attached to a single hair follicle, and the sebum is delivered to the surface of the skin by traveling up the hair shaft. The number of glands and the amount of sebum they produce are hereditary, though generally more sebum is produced after puberty and decreases steadily with age. The hair shaft is what people generally think of as “hair,” and is composed of many layers of a protein called keratin. This keratin is a very tough, dead protein, which is why it can be safely cut and styled. The keratin is naturally arranged in three layers: from the innermost medulla to the cortex to the outermost cuticle. As the outermost layer, the cuticle is what is typically treated with hair conditioning, repairing, and strengthening treatments.